The name of the game Deuces Wild refers to the fact that the deuces in the pack (those cards with a face value of 2) can stand in for any other card of any suit. It's like having four Jokers in the pack!. Special paylines (bonus) in the paytable for 5 of-a-kind. There is a 53rd card which is a Joker. 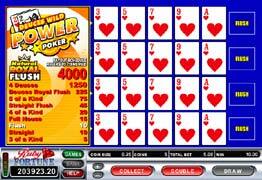 Deuces Wild Power Poker is different from the standard Deuces Wild video poker, as you play four identical hands of cards. At the beginning of each game only the first hand is shown to you, while the other three hands remain face down. The game then progresses like a standard video poker. The highest hand you can get is a Natural Royal Flush and it pays out 4000 coins, with five coins bet. 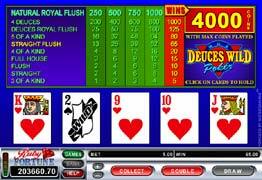 Deuces and Joker Power Poker is different from the standard Deuces and Joker video poker, as you play four identical hands of cards. The highest hand you can get is Four Deuces and a Joker and it pays out 10,000 coins, with five coins bet. Wild Royal w/2’s, and 4 deuces. 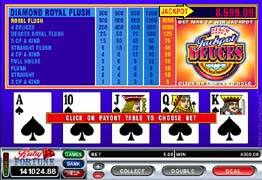 Jackpot Deuces is a video poker that is similar to the Deuces Wild payout schedule. Jackpot Deuces also has a progressive that is a constantly accumulating a pot of money. This can be won if you play for five coins and your hand contains the Ace, King, Queen, Jack, and Ten of Diamonds. The object of 4-Line Deuces Wild is to obtain a five-card poker hand that contains a winning combination. It differs from original Deuces Wild, since it has four lines of cards. The better your hand, the bigger the payout. You choose how many and which of your cards are to be replaced. You may replace your cards only once. Note: in 4-Line Deuces Wild, the deuces are wild – meaning a deuce (two) stands for any card, like a joker. Hence the name of the game. If you end up with a winning hand, you can accept the winning (press Collect), or you have the option to double it. Should you choose to double, the dealer draws an open card and you are given 4 unexposed cards to choose between. If you choose a card that is lower than the dealer's, you lose your original winning. If the cards are equal, it is a tie, and you have the option to collect your original winnings (press Collect) or double again. If your card is higher, you win double the amount of your original winnings. You then have the option to collect your winnings or double even further. Click this button to see the paytable. Click it again, to make the paytable disappear. 7’s are wild. Special paylines in the paytable for 5 of-a-kind, Wild Royal w/7’s, and 4 sevens.